'Chemin Walter Benjamin' reads a lemon-hued sign, half-hidden under tree branches. A shaded path heads alongside a house in the hamlet of Puig del Mas in southernmost France. The early July morning is already hot. Ahead, in the foothills of the Pyrenees, are the steep vinyards of the Côte-Vermeille, a wine-growing area which produces, among other varieties, Côtes du Roussillon. We have come to walk this 17 kilometre-long route over the Pyrenees, crossing an unmanned section of the border from France to Spain. It is from Banyuls-sur-Mer, a resort town two kilometres away from the trailhead, where we depart, bidding goodbye to a small French Navy destroyer anchored, seemingly permanently, in the bay – a reminder that frontiers within a supposedly borderless Schengen zone in Europe are under a new level of scrutiny. Like many who take the circuitous route over the mountains, we are doing the walk in a conscious commemoration of the last steps of the German literary critic and philosopher, Walter Benjamin, whose name the path now bears. Benjamin was one of many refugees who escaped the Nazis via this steep and at times dangerous route, a former smuggler’s path which winds the interior, shying away from the better-known routes near the sea but which the Vichy collaborationist regime established after the German invasion of France in 1940 had under surveillance. Hundreds, perhaps even thousands (no number has been recorded) of people successfully escaped France and Europe this way. Of all of those who took it, Benjamin is the only one who is known not to have survived to reach freedom. We start the walk late, at 8am, as we have had to prepare film equipment and props for the short film we will make about the crossing. We are also producing a series of still images, photographs of Benjamin’s own words in the form of fragments of text taken from his The Work of Art in the Age of Mechanical Reproduction, scattered through the landscape as we walk. At first the path is a relatively gentle ascent, winding through vinyards of a plastic, almost fluorescent, green. The area is a hive of activity, for a Sunday morning. As we walk uphill a buzzing noise reveals a drone flying just overhead. Slowly it descends, the blinking red eye of its camera turned on us, until it is plucked from the air by a man in an SUV dressed in a T- shirt and shorts, his car parked in an alcove underneath our path. Workers in orange high visibility trousers come and go in a small van with cut grass and brush in the back. They make several passes underneath us. Further up the mountain, a wiry endurance runner flashes past us on a nearby asphalt path, so quickly one of our group does not see him. For the rest of our walk we see no-one. Once above the vinyards the path rises steeply, zig-zagging up the mountain. We ascend five hundred metres in two hours. Parts of the trail are near vertical and we have to scramble almost on our hands and knees. Each step has to be judged over sharp undulating rocks. Steep drops await. Any fall on this terrain would mean an injury. In the émigré community and the French Resistance the trail was known as Route F, for Lisa Fittko, the woman who guided Benjamin and hundreds of others over it two or three times a week for seven months during 1940-1. At the time the narrow track of rock and scree was the only escape route from France. Many of the refugees’ ultimate destination was the United States, which had issued Benjamin an entry visa. They would travel to Barcelona, then Madrid, then to Lisbon, from where they would take a ship to the New World. In France the path is marked by intermittent yellow signs of the kind we encountered in Puig del Mas. There are also Route Nationale signposts, which announce the distances we must yet traverse to reach the Coll de Rumpissar, the summit and site of the land border between France and Spain. What really guides us on the trail when we are uncertain or nearly go off in the wrong direction are the black and yellow bars painted on rocks, the colours of the Grande Route 10, which crosses the entire spine of the Pyrenees from the Atlantic to the Mediterranean. We reach the summit at lunchtime. Our progress has been slow, impeded by our equipment and the need to stop to film footage every kilometre or so. On the top the wind is a thin groan. Succulents and cactus line the lip of the mountain. In the sky two jets race each other, flying parallel to Madrid or Barcelona, perhaps. The view is as stirring as she describes. To our left is the Torre de Querroig, a remnant of a medieval castle dating from the 13th Century. 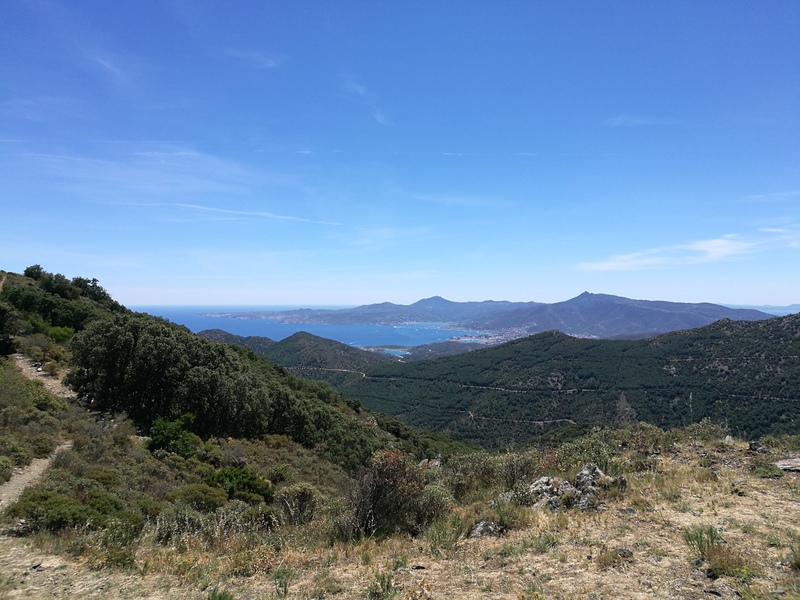 The summit is the only place on the trail where you can see France and Spain in stereo, taking in Banyuls and Portbou in a glance. In the distance the peninsula of Cap de Creus fingers out into the Mediterranean. Behind us, the French side is less steep and wild, its hills embroidered with vinyards where the Spanish side is uncultivated, thick with pines and cactus. The border is more than a line on a map; it spells a different climactic zone. From the summit the path is renamed the Ruta Walter Benjamin and red and blue signs labelled ‘Portbou’ guide us. At intervals along the path we find information lecterns which tell the story of Benjamin’s last walk in English, Catalan and Spanish, but which are nearly illegible, faded by the sun and scoured by wind and rain. The descent is tougher than our journey up. We often slip on loose scree with no secure foothold. It has the aspect of a trail meant to be used in one direction only; I can’t imagine how hikers would make it up the stretches we skid down. The real marvel is how refugees, many of them urbanites recently arrived from Paris or Marseille and without our state of the art North Face walking shoes and six litres of bottled water, were able to traverse this path with only bread, tomatoes and black market marmalade to share between them. As we walk I imagine their fear of the real probability that around any corner they might encounter a border guard who would almost certainly return them to France, a country which had become a death trap. We arrive in Portbou just before five in the afternoon. The émigrés’ arrival would have been not very different from ours, apart from the Citroen Cactuses and the Renault Méganes parked inside the hulking Victorian-era tunnel which leads from the mountain into the town. They struggled into Portbou in the afternoon on September 25th 1940, passing underneath the railway sidings, emerging from its darkness into a blaze of light, a small avenue lined by pollarded plane trees and, in the distance, a flash of blue Mediterranean. It took all of Benjamin’s small group’s remaining strength to ascend the vertiginous staircase into the station. The were badly dehydrated, but they agreed that it was best to present themselves to the customs office to get their papers stamped for onward travel as soon as possible. The customs offices in Portbou rail station are still there, although long closed. You can look through smudged, cracked windows to see ornate interior depots with ceilings three stories high. The Spanish border presence on the day we visit consists of a lone Guardia Civíl officer with an Argentine accent who occupies a dusty desk with a telephone, as if the computer era had never happened. It was in an office much like this one where Benjamin’s group were informed that the Spanish government’s position had changed. Franco’s regime would no longer recognise the papers of those who had crossed the border illegally. The officer told them they would be returned to France the following day. There the group faced immediate internment by the Vichy regime. The group was put under armed guard in the Hostal França for the night of September 25th. The building is still there, in a small plaza. It looks tiny and shabby. In fact, with its mini-ramblas, tight semicircular bay and low-rise houses, Portbou has a miniaturist quality, like an abandoned architect’s scale model for a much larger city. Apart from the rail station, whose scale is that of a train station in a major metropolis: Paris, or Barcelona, say, a remnant of an era when borders were physical, and not dispersed in space and time via technology. Some time in the night of September 25th or in the early hours of September 26th Benjamin took from his pocket the morphine pills he had been carrying with him since he left Marseille – he had ‘enough to kill a horse’, according to Arthur Koestler, Benjamin’s friend and fellow émigré. The next day the refugees woke to the news that the policy had changed. They would be allowed passage after all. Benjamin did not respond to knocks on his door, to urgent entreaties to get ready for the journey onward to Barcelona. If Benjamin had arrived in Portbou one day earlier, before the edict preventing illegals from making the passage through Spain, he would have lived. One day later, when the decision, or mis-communication, had been forgotten, he would have lived. Knowing this now, it is difficult not to think of the workings of fate. Before making the arduous journey over the mountain, Benjamin had been stripped of his German citizenship, had his apartment in Paris searched by the French in the first hours of German occupation, and had lived at 28 different addresses in his seven years of exile. As a German Jew, if he remained in France his most likely fate was to be interned in a transit camp before being shipped to a concentration camp. There his life would end. Route F was his only chance. He seized it, without knowing how it would end; in mis-communication, confusion, exhaustion. The day his body was discovered, bills were prepared, in pesetas, for Benjamin’s stay. His uneaten breakfast was charged. The coffin maker’s detailed bills have also come to light. The US dollars in his suitcase went some way to covering his expenses. His fellow escapee, Henny Gurland, provided the rest from her own funds. 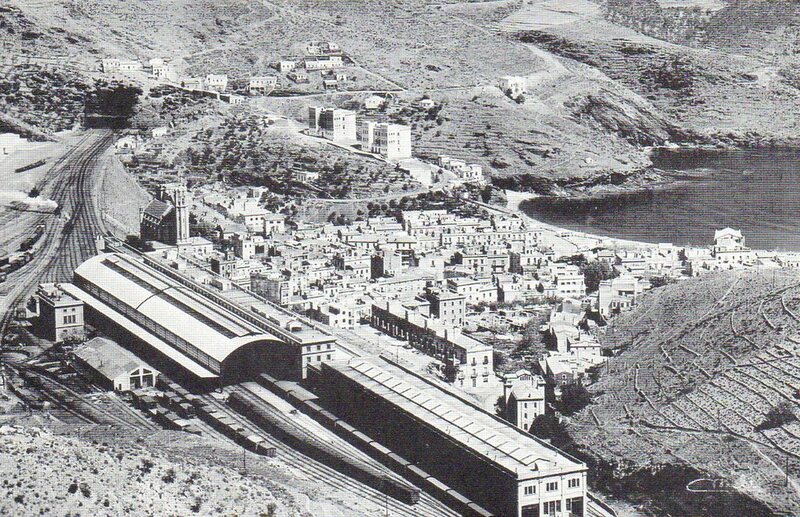 Portbou and its railway station in 1940. Earlier that afternoon we emerged from our walk via the darkness of the long viaduct blinking into the light. At the mouth of the tunnel a young woman sat on a plastic chair, staring into her phone. There was no need for a parking attendant, as parking in the tunnel was not charged. Opposite, a man dressed in the blue and yellow high visibility overalls of a streetcleaner (it was a Sunday) lounged against the wall of the tunnel, eyeing us closely. As we appeared he stepped forward. For a moment he seemed to be about to say something to us. We had exhausted our water supplies and needed to restock. We veered into what we took to be a shop and which turned out to be a liquor store, where we bought two one-litre bottles of Font Vella. Two bandy-legged men manned the liquor store. I wandered along the aisles. There was a surprisingly vast range of litre and quarter litre bottles of hard liquor, gin and vodka varieties I had never heard of. ‘Would you mind coming out of the shop,’ one of the bandy-legged men said to me in Spanish. ‘I’m worried about your backpack.’ He pointed to my day-pack which, while full, hardly posed a threat to his bottles. His eyes flickered. I understood his discomfort was not really about my backpack. We left, climbing the stairs – another near-vertical ascent – to the rail station. On the way I pointed to my companions out the former Hostal França, where Benjamin had died. We did not stay to ask if we could go in. It was my fourth visit to Portbou. It’s hard to know if it is the place itself, hemmed in by two high hills in the last gasp of the Pyrenees, or if it is the shadow of Benjamin’s death which is responsible for the instinctive dread I feel in the town. It is a fascinating place, in many ways, with its belle époque architecture, a fusion of France and Spain, artist Dani Karavan’s spectral monument to Benjamin on the hillside, its faded colonial streets which make it look, at certain angles of the day and night, like a town in Panama or Nicaragua. But there is a surly, obdurate, energy to the town. Perhaps all border towns have this, an agglomeration of the anxiety of people whose lives have been truncated by border zones and the authoritarian function of such places. Our journey that day had been accomplished with a deceptive freedom. We walked across the mountains and the border unchallenged by any human being, with the comfort of our maroon-covered passports in our backpacks should anyone demand to see them. We had been guided with the help of Google and GPS; we’d had a mobile phone signal nearly all the way. We were easily tracked (and perhaps we had been) should the authorities had any interest in doing so. Yet borders are proliferating. On October 1st this year Catalunya will hold an independence referendum vote. It is possible that a different kind of border will one day be demarcated: that of an independent nation, the first such secession in western Europe since Belgium seceeded from the Netherlands in 1830. And in less than two years' time our (British) European Union passports will change colour, signifying the greatest repeal of citizenship since the Nazis passed the Nuremberg Laws in 1935 revoking the citizenship of German jews. A new web of borders will appear for us in an instant. Earlier that afternoon, as we neared Portbou on a relatively easy road, thankful we were no longer heading downhill at a forty-degree angle, we reflected how we might face even greater challenges to escape than Benjamin and his contemporaries did, should the tables turn and we become migrants ourselves. The border is everywhere, now, thanks to biometric passports, mobile phone GPS tracking, thermal imaging cameras - and, who knows?, even drones - and we might be only its captives-in-waiting.